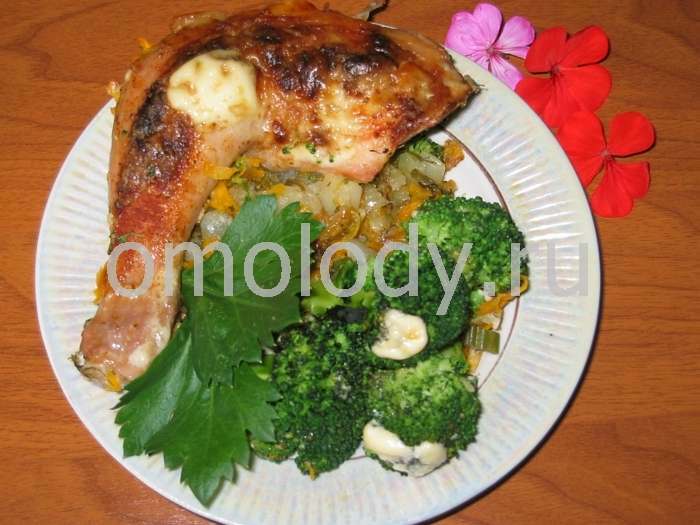 Chicken legs with spices baked in the oven, serve with broccoli. Recipes from Russia. Chicken legs with spices baked in the oven. Poultry dishes differ by the easy digestion. Young small chickens have a tender, white meat with delicious lightly sweet taste. Chickens in sour cream is an excellent treat for dear guests. 3 - 4 tbsp oil. 5-7 chicken legs with thighs. 1-2 tbsp mayonnaise to top. 1. Put chicken legs in the pot. Sprinkle with spices, garlic, season and bake in the oven until done. Set aside for several hours in the refrigerator or in cool place. 2. Put chicken legs into skillet and place into oven for 30 - 35 minutes. 3. Brush every leg with mayonnaise and put into oven for 10 - 15 minutes, or until legs become golden - brown. 4. Serve with broccoli and finely chopped greenery or with backed potatoes.